I remember going to a friend's house in high school in the fall and there being a big bowl of candy corn and salted peanuts. It's a perfect combination of sweet and salty, crunchy and chewy. 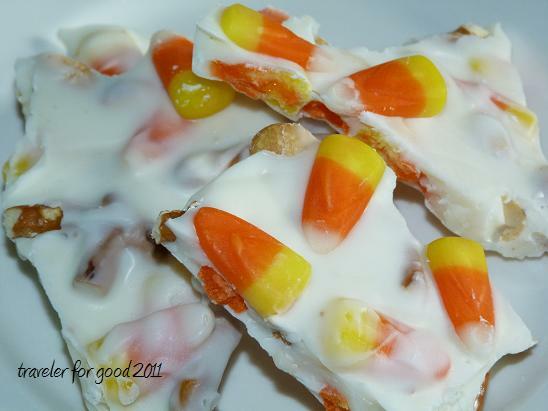 So when I saw the recipe for Candy Corn Bark on the Jolts & Jollies blog I knew that the only ingredient I needed to add was peanuts. It's quick, easy and looks very festive for fall. Melt the candy coating in a microwave safe bowl, following package instructions. Stir every 30 seconds or so until smooth. After removing from the microwave mix in 2 cups of candy corn, pretzel pieces and nuts until coated. Pour onto wax paper (you can put it on jelly roll pan to keep it contained if you want) and spread with a spatula. Use remaining 1/2 cup of candy corn as decoration, sprinkling on top of bark and pushing gently into the candy. Let cool and then break into pieces. I'm thinking that bark for all occasions may be in order...there are different seasonal candies available all year. Bark is also great for gifting...yesterday I went to pick up a donation of shoes for Soles 4 Souls from a friend. She left her shoes between her screen door and front door. I replaced the shoes with this candy corn bark. A fair trade all around.